The school of thought that knowledge is power is true and based on fact and so empowerment and action can be the difference of the haves and the have knots. Canadian Financial Literacy at any stage of life is the main focus of Money Canada Limited and the purposely designed products and services are made to fulfill a growing need to spread the wealth through the word. In and through any medium; be it blogging, newsletter, magazine, video or television the message is clear with news, reviews and interviews as the main premise and money and personal finance as the primary learning outcome. As a media company and an profitable business we are encouraged by many and rewarded by profit. At the same time as we are honored to promote the most important social media subject that everyone can relate to in financial literacy. 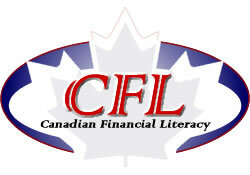 Canadian Financial Literacy is the key to fight poverty and getting to kids at an earlier age is the key to success. There are real and problematic concerns about poverty that are dynamic and reach the society and affect the country at large and the standard of living. There are many children and families in Canada that live below and well-below the poverty level. Education for children and young adults is under served or non-existent, these simple courses, information, ideas and concepts will definitely help in the war on poverty. 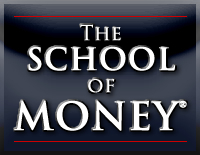 You are a student, a class, a school or principal and you know or need to learn more about the importance of learning about money then you have come to the destination place. The MONEY School quality offer of valuable products, services and turnkey solutions deliver an important agenda for society, schools and parents. Children and young adults are priceless but may not know a lot about money and personal finance this creates a teaching moment, life-long lesson and a raison d'etre for The MONEY School. 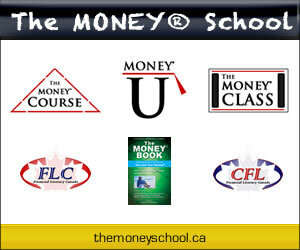 MONEY.CA online is proud to sponsor The SCHOOL of MONEY for individuals and host all online activities and basic MONEY Membership access to courses, information and newsletters and database. The MONEY Book a smart easy to read and hard to put down e-book that tells the simple truth and explains the misconceptions in MONEY and Personal Finance. From budgeting to wills and estate planning the complete spectrum of the core financial services is explored and de mystified. Everything you wanted to know about MONEY but were afraid to ask is revealed and demonstrates sense and sensibility in making, saving and preserving money. The MONEY Book is 10 powerful and important chapters that tell the story of the most important aspects that lead to long-term wealth and savings. The MONEY Book along with 10 moving videos leave a lasting impression that is invaluable and the top 10 questions and answers are priceless learning lessons and outcomes. Niall Ferguson professor at Harvard and author of the best seller "The Ascent of Money" says 'simple and effective' and congratulates to The MONEY Book with an endorsement of WAY TO GO!. 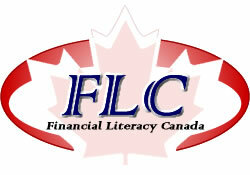 A lot has been said of "Canadian Financial Literacy" and less done. The MONEY Book answers the call and goes to all lengths to captivate the interest of new generation of Canadians that want to and ought to know more to have more. 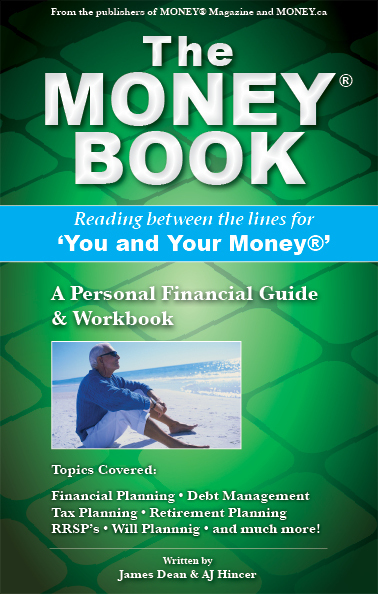 Enjoy free tempting single chapters as promoted by MONEY.ca and The MONEY Network entire that may lead to buying the rest of the knowledge you need to know about "You and Your Money". 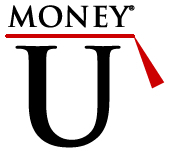 The MONEY Course curriculum for: Students and Young Adults is available online at money.ca curriculum for: Novice Investors, new Canadian Immigrants and Advisor programs arranged by The SCHOOL of MONEY and is CE approved for Advocis. MONEY Media provides the Top 10 Questions and Answers - Video of Industry professionals, advisors and instructors give described video a new life and meaning. History of The Canadian Dollar is complete and accessible online at money.ca and represents an important and official account of money in Canada according to and specifically for the history of money in Canada for Canadians. MONEY.CA makes The History of The Canadian Dollar an important and factual account of money that encourages students and users about the recent past of money to help determine a complete understanding of the past that sets the stage of the future of money in Canada. Over 100 questions with various type questions and answers that are online with automated testing - correcting - response and administration for educators. Combined courses, programs and curriculum is available online by video - online - web cast and simulcast where and when booked or available by schedule or invitation. The MONEY Class may have a double entendre meaning both the upper class and well-to-do as compared to those that are more common in number and less fortunate. The difference between the 99 and the 1percent could be knowledge and a determination to change the numbers and more in favor of better overall numbers. And so it takes time and effort for those who have less to learn more to earn more which is notably not wrong. There are those who have and have advantage and start from and with advantage and there are usually more of those who have less advantage. A small book that was well-digested called The Pig and The Python declares trillions of dollars of wealth will be transferred from one generation to another and will be complete by the next 20 years. It is arguable exactly how much money will be transferred relatively but it is a known fact that this sort of thing can and will happen;money and assets will be transferred and not necessarily in the knowledge to manage, maintain and grow the wealth. You may have money coming to you and you may not, the best advice is to be able to be self-made and independent if you have to, you have to and if your lucky and you got it made you will still have to be responsible and not reckless and still charity can benefit over governments and their tax regimes. Learn more options about classes, courses and schedules for web casts and video including products services and MONEY U. The School of Higher Learning - Investment and Finance has and always will be a great sector for employment and usually a high paying salary and satisfying career can be found in all industry where financial and investment professionals are wanted and sought after hired guns. Knowledge is Power - and it has not changed in fact animals have instinct and humans may transfer wisdom and wealth from one generation to the next. Inter-generational wealth transfer is big business and important and meaningful to both givers and receivers and if done right more knowledge and more value stays in the family and works positively to enjoy use and employ in the best ways possible. People would like to share the wealth with friends and families if they naturally had enough or too much of course they would give some to charity. Knowledge and wisdom is important to pass down together and sometimes without choice either is better than none. And if you do not have the money and nor do you have the wisdom the next best thing is to invest in MONEY and our plan to learn more about the subject we find ourselves specializing in exactly. Join us in a never ending odyssey of learning that leads from almost kindergarten to the Higher Schools and Colleges of Learning and training that lead to high success and long-term finance careers and business management. Financial Literacy Canada and Canadian Financial Literacy - a dynamic duo that goes to the corners with outreach programs that change the way people think about money, personal finance and wealth building. MONEY - FLC and CFL are determined to create important, long-lasting and valid programs and education tools that make a difference. The Internet is a an important way to get to the next generation and those Canadians who know less. The motto is "learn more to earn more". Truer words could not be said of the ancient idiom of 'knowledge is power'. Financial Literacy Canada has come out to join in on the fight against poverty and has actively joined the platform, the idea and concept. Desmond Jordan owner of many Sylvain Learning School Franchises summoned up this old idea and was encouraged to develop a destination site and in fact mirrored the raison d'etre of Canadian Financial Literacy. Financial Literacy Canada and Canadian Financial Literacy works hand in hand and promotes the exact same message and delivers it to those who need it and those who can sponsor it. Financial Literacy Canada along with Canadian Financial Literacy are one in the same and make communication by Internet and professional media and press release the importance of financial literacy in Canada. MONEY with CFL and FLC creates important products and services that are meant to spell out the difference and knowledge that determines incomes and outcomes. There is a big responsibility to take on in the challenge of fighting poverty. Money Canada Limited has started that fight and has trained long and hard to do the hardest work to make the biggest and longest lasting force for change. The gap between those who have and those who do not is growing by evidence of recent social protests. The complaints are all relevant and at one time refers back to simple principals. Knowledge is Power and education is the vehicle that determines our destination, wealth and riches. Learning to read is so important and fundamental and little is done to promote reading and arithmetic as a complete financial literacy objective. MONEY knows money best and personal finance is what we do best and we are ready to inspire others in many ways, shapes and forms. The MONEY Vertical lends itself to blogs, information and articles to organized monthly newsletters to full 4 color process magazine that are meant to deliver value for money. And still our vast network of financial content in many medias allows our subject matter a passport to connect in many ways including web cast, video and television. MONEY also encourages "described Internet" that seeks to serve another large and under served segment of the Canadian population. MONEY and it's collaboration with important people, sites and open cooperation creates a winning combination in making a lasting contribution to an important social media and subject that effects many Canadians.